The search for Ciaran Jones, 25, resumed this morning and involves mountain and river rescue teams, as well as air support and gardaí. 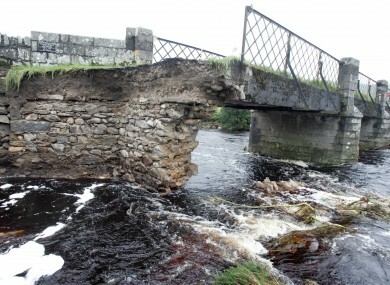 File photo of the Ballysmuttan Bridge in Co Wicklow, where Garda Jones entered the river yesterday. A BODY HAS BEEN located by people searching for an off-duty garda who was swept into the River Liffey in Co Wicklow last night at around 7pm during heavy flooding. Ciaran Jones, 25, from Manor Kilbride was trying to help people affected by the floods at the time and was pulled into the river. Searchers recovered a body at the Ballyward Bridge, around 5km from where Ciaran Jones was swept away, at around 8.35am. The body was taken from the river and to Naas General Hospital for identification. A post mortem is due to take place later today. Earlier, Superintendent Eamonn Keogh of Blessington Garda Station told RTÉ’s Morning Ireland that it is understood that Jones and his friends were at Ballysmuttan Bridge near Blessington at the time of the incident. The garda was crossing the bridge to warn an approaching motorist not to drive any closer to the bridge when he was swept into the river. A search was launched almost immediately and was called off at around 1am. The search involving gardaí, the army, the Glen of Imaal rescue team, an air support unit and a number of other local people resumed early this morning. Email “Unidentified body located in search for garda swept into Liffey during floods”. Feedback on “Unidentified body located in search for garda swept into Liffey during floods”.